Welcome to Anime Feminist History, in which contributors take turns choosing an older anime series and examining a character, plot point, or scene under a feminist lens. This week, Lauren kicks off the column with a look at Noa Izumi in 1989 mecha show Patlabor! If most giant robot anime are based on masculine stereotypes, Patlabor is based on a feminine one. Usually, mecha are intended as weapons of war, but Labors (as their name implies) were originally intended for municipal tasks like construction and keeping the peace. Nobody ever expects Noa to be a cop. It’s always played for laughs when Noa informs people (usually men) that she’s actually the pilot of that giant Labor standing over there. Noa’s position as a female protagonist also makes light of the trope that a woman needs to be twice as good as a man to get the same role. Ota Isao is a hothead who is often demonstrated to be laughably incompetent as a Labor pilot but he still has the same job and status as Noa. Usually, Noa’s okay with that. Even if Ota also gets to pilot his own Labor despite her being the one who constantly has to pull him out of scrapes, at least Noa can rest assured that she’s more competent than her teammate in every way. That is, until episode 36, “Noa’s Adventure,” when during target practice, Noa discovers that Ota is twice the marksman she is. He certainly has more experience with shooting—while Noa is hesitant to use her gun within city limits and risk harming the residents, Ota’s temper usually ends up getting the best of him. 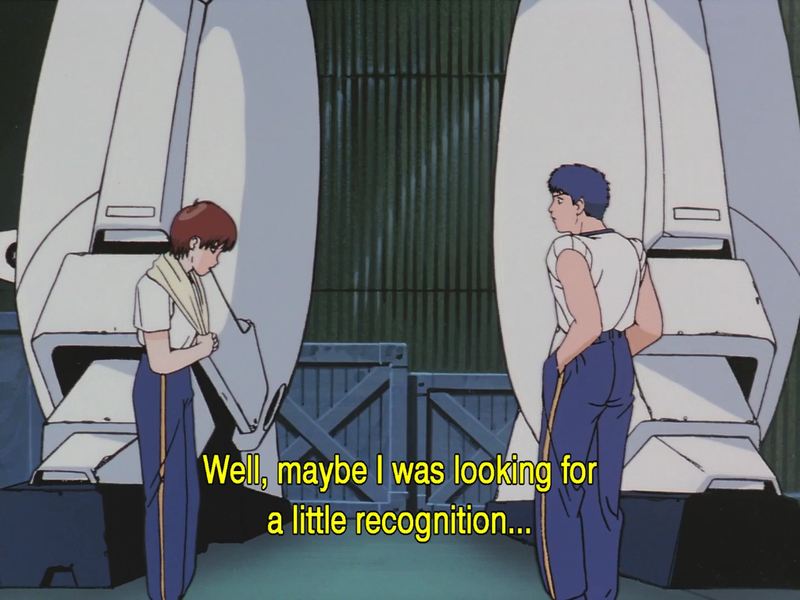 In “Noa’s Adventure,” it seems to Noa that everyone on the PatLabor team is growing and gaining skills except for her. So when she spots 10,000 yen bills floating downstream on her way back from a food run, she opts not to notify her unit about the potential police case. Instead she sets off by bicycle to apprehend the culprit herself. It’s a sweet episode that shows how much Noa’s teammates worry about and care for her when she doesn’t come back, especially the normally antagonistic Ota. But the major lesson of the episode is that Noa’s insecurities were all in her head. She doesn’t get so much as a slap on the wrist from the chief. And as Asuma points out afterwards, Noa already proved herself in spades during her pivotal battle with the Black Labor. Nobody doubts that she belongs on the team. Noa’s doubts in this episode show her falling into a common trap for high-achieving women—Imposter Syndrome, or the feeling that you are a fraud fooling everyone with a veneer of competence. It’s easy to see why Noa might feel this way when she’s so often treated as an equal to somebody as bumbling as Ota. When you have to be twice as skilled as a man to be considered as good as him, it’s hard to feel like you have any talent at all. Back in 1989 when Patlabor was created, it was more realistic to imagine a future with giant robots than one where women were treated equally all the time! But they were right; issues like Imposter Syndrome are just as critical to discuss today as they were then, especially for women. We still have to worry about whether we’re perceived to be as good as men doing the same thing. We still feel the pressure to keep our professional skills sharpened and stay ahead of the pack, especially as we get closer to an age when employers begin to assume we will become less career focused. Almost three decades later, Noa’s concerns are sadly still relatable, making this 1980s mecha anime surprisingly relevant to women working in the 21st century. Thanks to our generous patrons we have committed to paying all writers in 2017! However, we are still a little short of the $800 in pledges we need to be able to do that and are relying on you to help us hit that goal by December 31st. Almost half our patrons have pledged just $1 which adds up to a massive $80 every month, it’s an enormous help and appreciated more than you might realise. If you appreciate our work, believe in paying content creators fairly and can spare just $1 a month please become a patron today! Lauren Orsini is a writer, blogger, and anime reviewer. She writes about geek careers at Otaku Journalist. Her latest project, Anime Origin Stories, is an oral history of anime fandom.